Vintage swimwear is a major fashion find. These retro style bathing suits and bikini’s were so fashionable back then, they are still making the rounds in top stores today. So where did it all begin? Vintage swimwear has a long and rich history. Back in the old days, in ancient Rome, people were swimming mostly naked. That’s interesting, but not as interesting as the contrast that came in the following centuries. 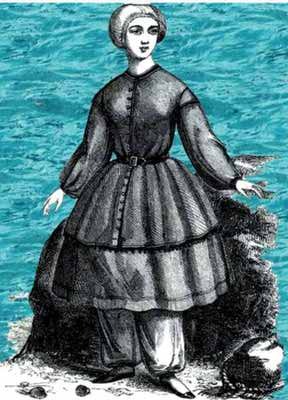 Back in the day, people were wearing uncomfortable bathing suits with long sleeves, unusual pieces of clothes similar to dresses, impractical for the beach and warm days. It’s all related to the historical circumstances and women’s position in society. It was very scandalous for a woman to show more than her ankles in public, even if it’s the hottest summer ever. That’s why some women have even had lead sewn into their underskirts, to make sure that they will be decent on the beach. But that’s the 18th century we’re talking about. Luckily, all we have today from that era are photos and illustrations. We can skip all those boring phases in fashion history of vintage swimwear and jump into 20th century, when a true swimwear revolution happened. Back in 20’s there was a beauty competition in Atlantic City which included a vintage swimwear contest. But we have waited 25 years more for the first bikini. Yeah, finally, a two piece swimwear! Michelle Bernardini was the first lady photographed in this kind of seductive swimwear. But that was just a small step for bikinis. They were considered too provocative and they were widely accepted ten years later, when Brigitte Bardot showed up in a bikini on a movie poster. That’s when a new swimwear era definitely began. Pin up culture and fashion have also done a lot for the bikini history. Retro vintage swimwear from 40’s, 50’s and 60’s are still widely used and vintage lovers can still have a swell and peachy summer in the hottest swimming clothes. Punkabilly clothing brings you a sweet vintage collection of swimwear enriched with rockabilly and pin up spirit. It’s all here in one place. Another inseparable part of this pin up swimming collection is the sailor style, manifested in navy blue color, stripes, buttons and ribbons. As for the rest of our collection, we’re happy to present you some fierce punk rock bikinis with skeletons, the boldest and the craziest combinations on the beach! As you can see, we have chosen the best of swimwear history and modified it for the needs of a modern woman. Punk bikinis will make your summer hotter and pin up swimsuits will refresh your days at the beach. They’re made to express the best body curves and celebrate the beauty of a female body. Get ready for the summer in a totally different way, dive into the summer armed with the most elegant pin up and punk rockabilly fashion and just go with the flow!